Our fresh, delicious ice-cream cakes are made with only the best local ingredients. So good, they’ll give you goosebumps! We make all of our beautiful bespoke cakes to order & they are ideal for special occasions. Choose your favourite flavour of our astisan ice cream for the base & then top it off with as many different flavoured scoops as you’d like! We can even drizzle melted chocolate over it for you! Cakes start from R510 for 20 to 25 people but we can cater for up to 125 people in one cake! These gems do take a little time to make so we usually ask for 72 hours notice, but if your deadline is tight give us a call and we’ll see what we can do. WHICH FLAVOURS ARE AVAILABLE TO CHOOSE FOR MY CAKE? We usually suggest a base of 70% chocolate, Madagascan Vanilla or strawberries & cream, but we totally understand that your favourite flavour might be different to ours, so take a browse through our every day flavours for some inspiration. Once you’ve chosen your base flavours, see which flavour combinations take your fancy for the tower of scoops piled on the top & if you’re in any doubt give us a call to discuss your needs. WHAT SIZES TO THE CAKES COME IN? Our smallest cake is 20cm which easily serves 20/25 people, but we can cater up to 125 people in one cake. ARE THE CAKES GLUTEN FREE? All of our ice creams & sorbets are gluten free & as our cakes are made of 100% of our hand made ice cream, our ice cream cakes are gluten free too. HOW MUCH FREEZER SPACE DO I NEED TO STORE A CAKE? Our smallest cakes require around 30cm diameter & 30cm in height. Chat to us about the size of our larger cakes. HOW ARE THE CAKES PACKAGED? Our cakes come wrapped & securely packaged in a card board box. HOW SHOULD I COLLECT & TRANSPORT THE CAKES? Some people like to bring their own cool box to transport our cakes home in. Others are happy transporting them in the box they leave the shop in. As they are beautiful works of art, we dont recommend leaving them out of the freezer for any length of time, so make sure we are your last stop off on your way home to ensure they reach your freezer as quickly as possible. HOW CAN I PAY FOR THE CAKE? We accept cash, credit cards, zapper or EFT prior to collection. WHERE DO I COLLECT THE CAKE FROM? We have a retail unit at The Litchi Orchard, Salt Rock where all of our cakes are made & stored ready for collection. HOW DO I SERVE THE CAKE? We recommend taking the cake out of the freezer 5 minutes before service, to allow the ice cream to soften slightly. Most people like to serve individual scoops from the cake, but we like to take a hot knife to the cake & serve it by the slice. HOW LONG BEFORE THE CAKE MELTS? We usually find that the cake starts to melt after about 20 minutes; but this is of course weather-dependent. HOW LONG CAN I KEEP THE CAKE IN THE FREEZER? 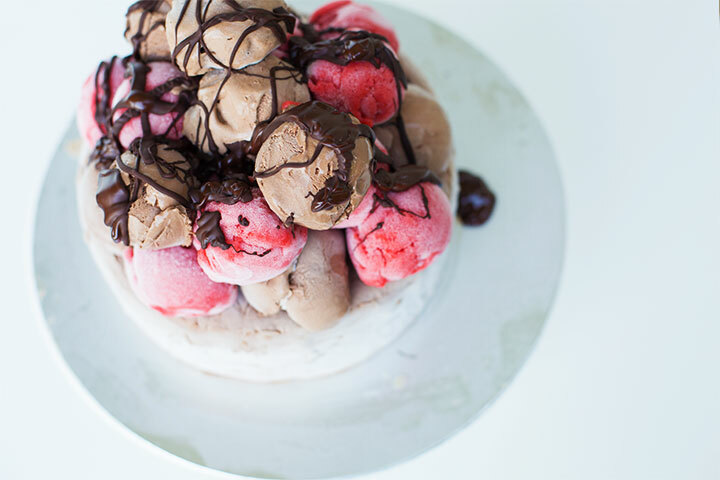 One of the many benefits of ordering one of our ice cream cakes is the fact that it stays fresh in your freezer long after your function has been & gone. So if by some small chance you have left overs after your party, you’ll find the ice cream is still good for another month or so.